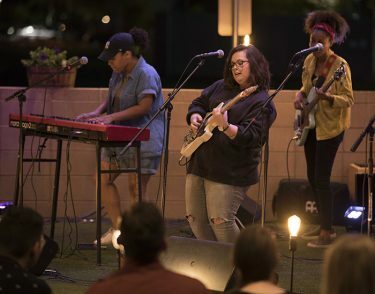 The setting for the Canyon Worship Songwriters Showcase proved ideal for the performers and the crowd that packed the outdoor patio of the Canyon 49 Grill. Geoff Hunker is in Satellites & Sirens, a prominent Christian rock band. He is a worship leader in a church. 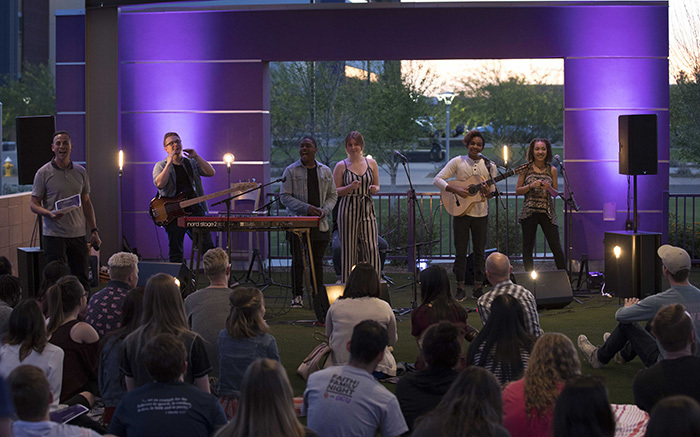 He is everything students in the Center for Worship Arts at Grand Canyon University want to be. And yet they are everything he wants to be, too. There was plenty of room for attendees to spread out on the patio’s artificial turf. Hunker has been coming to the GCU Recording Studio from his home in Gilbert every week to help produce the Canyon Worship 2018 album, written and performed by students in the Worship Arts program. 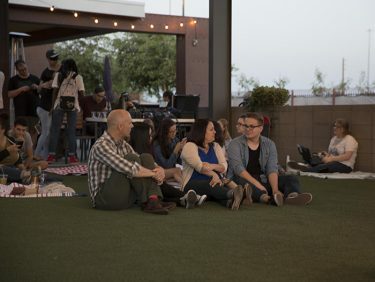 Monday night, he had another reason to come to west Phoenix: He was in the audience for a public display of that music, the spring edition of the Canyon Worship Songwriters Showcase in the jam-packed outdoor patio of the Canyon 49 Grill, which proved to be a perfect venue for the event. All 12 of the songs the students performed are candidates for the album, and the wide variety of sounds made it clear that it will be filled with talent and diversity. Hunker had no idea there was so much spirit in the Recording Studio until he started visiting, and he keeps getting reminded of it the more he is around its daily occupants. “To see the talent of the students and to see the hearts of the students, too – that’s been a really cool thing for me, to actually get to know some of these students and see how much they love the Lord,” he said. “They try to walk it out and they’re doing their best to go to these classes and learn about how to do this craft better. Freshman Chris Calderon said he felt welcomed from the first time he came to the GCU Recording Studio. “Everyone’s together every day, eating together, praying together, worshipping together,” he said. “It made me re-evaluate my life because so many people are so dedicated to serving God. I was just touched by that. But it’s about more than just the relationships. Yes, that part is great, but they’re also the rocket fuel for the music that is coming out of the program. 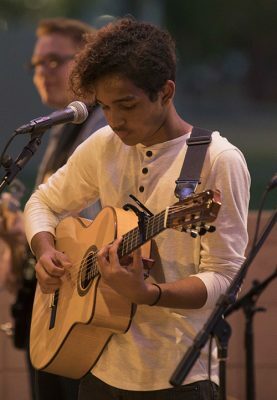 Calderon had planned to attend a prominent music-only college when he changed the lyrics of his life course and decided on GCU instead. He’s glad he did. One of those opportunities is to meet people like Hunker. Ronnie Petkovich, a senior who joined with Micah Ruiz Esparza to perform “Run Back to Me,” got an internship with Satellites & Sirens two years ago and got to help Hunker write one of the group’s albums. Now he’s a worship leader at a church in Prescott. Oh, and one other thing: Right after he graduates at the end of the month, he’s getting married … and the ceremony will be officiated by Hunker. “The relationship and seeing how he’s grown and how he’s helping other students here grow, too – I love it,” Hunker said. Petkovich sees that growth in the musical genres the Worship Arts students are exploring – “People are taking risks, which is something that our culture needs right now, especially in Christian music” – but it’s also evident in the talent. Mallory Denson (playing guitar) was chosen to perform two songs at the Showcase. It took a lot of students to make it all come together. The production people were on the patio in the early afternoon getting everything set up, and the musicians arrived at 4 p.m., by which time the temperature had climbed into the 90s. The heat made tuning the instruments more difficult, especially after the sun went down and the air cooled a bit, but the setting made it all worth it. “Everyone connected on a social level like I’ve never seen, and I think it’s because of the venue,” said Recording Studio Manager Eric Johnson, whose idea it was to take the Showcase to the Canyon 49. “I think when everyone came in they saw the turf, they saw the color, they saw the awning and the weather was really nice – nice sunset – everybody really got into it and it became this little party. And that, in turn, made it easy for the audience, which filled just about every available space of the spacious patio, to enjoy it. They brought blankets and sat on the artificial turf. They cozied into the sofas and soft chairs. They ate their dinner at one of the tables. Plus they got all that musical variety, which made people like Hunker especially happy. “Music, and especially worship music, is always changing. It’s cool to see these students trying to do something a little different with it,” he said. “And being in Christian music and hearing songs on the radio, I think it’s cool to see students who love the Lord and are writing songs for Him and for other people. So do they, Geoff. So do they.